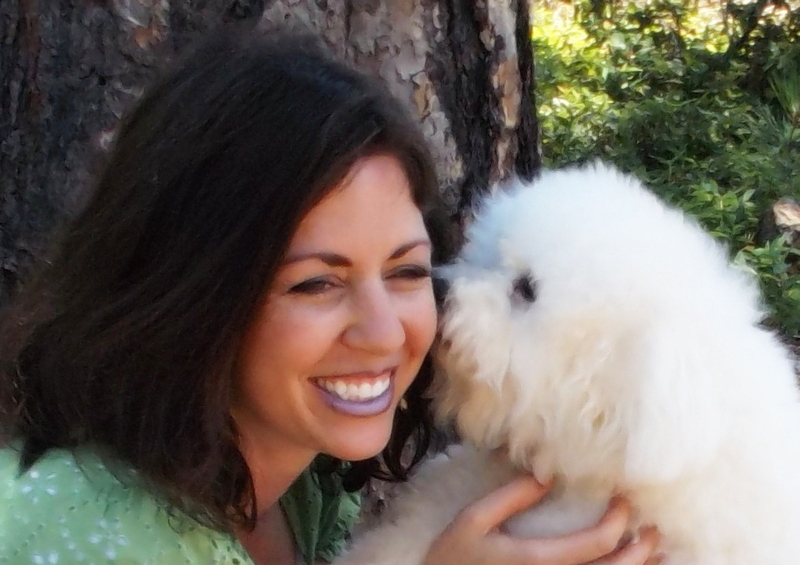 Nestled on twelve wooded acres in the foothills of the Sierra Nevada Mountains, we are dedicated to breeding beautiful, affectionate, playful, and healthy AKC Bichon Frise companions. Our puppies are socialized with adults and children of all ages, and each one is loved and cuddled extensively. Being raised in the heart of our home our puppies are accustomed to everyday noises and household activity. Our puppies enjoy frolicking on the lawn and basking in the sun. We are distinguished as AKC “Bred-with-Heart” for our dedication to health testing. 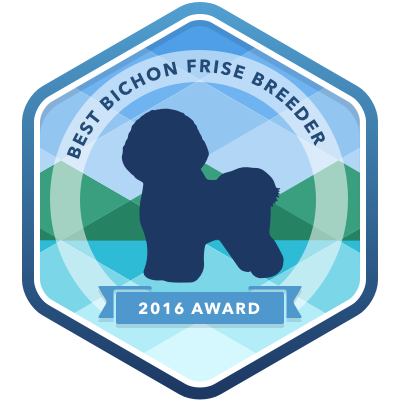 This accomplishment ensures that our Bichons are free of the hereditary defects that OFA has determined to be the most prevalent in Bichons. All of our Bichons are OFA health tested and certified for their eyes and patellas and hips (after age 2), which are the recommended health tests for Bichons. The health of our puppies is also ensured by excellent hygiene and nutrition and regular deworming and vaccinations. All of our puppies are thoroughly examined by our veterinarian prior to placement in their new homes. 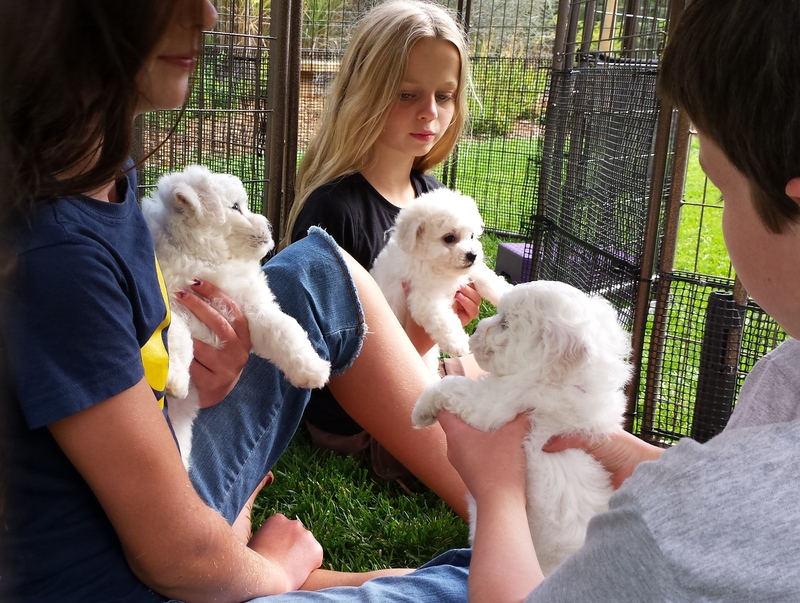 All of our Bichons are AKC registered with excellent champions lines. Check out their pedigrees and OFA certification information on our “Our Bichons” page!! Our home is conveniently located five minutes off I-80 in Eden Valley, California, just under an hour east of Sacramento. Our clients are the BEST!! Here are the super sweet and fun Wozniaks with some of our crew. Their Bichons eat better than I do!! 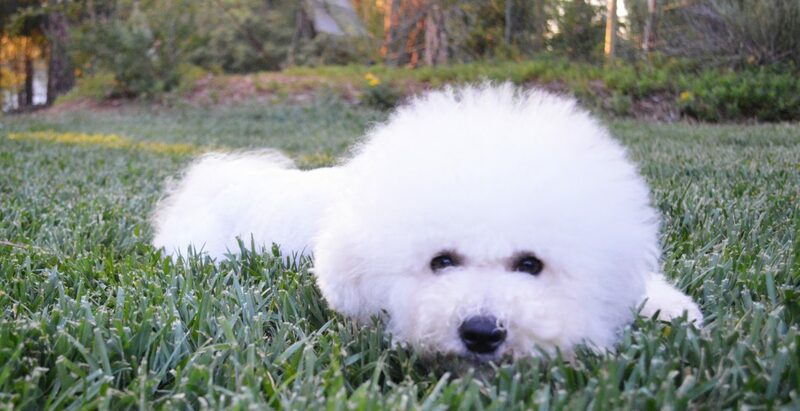 “On behalf of Vetary.com, I want to congratulate you on the Best Bichon Frise Breeder Award. 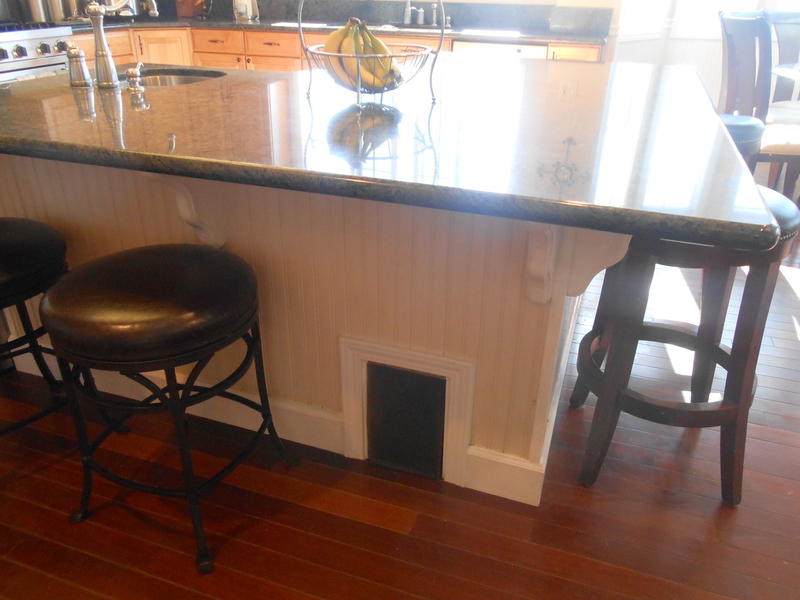 We receive many comments on the doggy door we installed in our kitchen island. It is the entrance to an enclosed passageway leading to our fenced yard. In this area my experience as a mother is invaluable. I know how physically and emotionally demanding pregnancy, delivery, and lactation can be. The health and well-being of the mother is of utmost importance in delivering and raising healthy puppies. I work with our knowledgeable and experienced veterinarian to provide optimal prenatal and postnatal care for our mothers and puppies. She is kept in optimal health prior to pregnancy and throughout her pregnancy with nutritious foods, vitamins, and salmon or fish oil rich in Omega 3 fatty acids. Also, nursing several puppies can be draining for the mother. She requires plentiful, protein-rich nourishment. I supplement my nursing mother’s diet daily with fresh food including rotisserie chicken, salmon, and cottage cheese. She also enjoys fresh eggs from our chickens and organic sweet potatoes from our garden. By 3-4 weeks I start the puppies on soaked puppy food with added fresh protein-rich foods, which takes some pressure off the mother. She will nurse them faithfully until 7 or 8 weeks, which provides the best possible start for the young puppies. 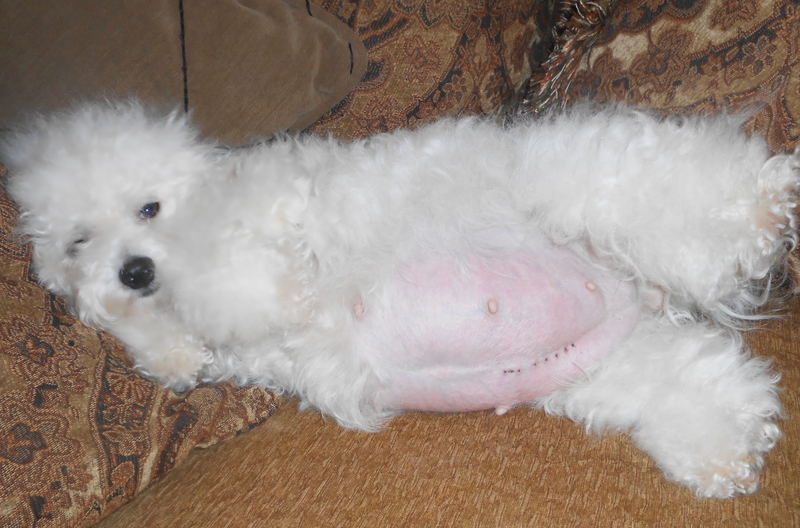 This mom had a stillborn pup removed by c-section in a delicate procedure 2 weeks before her due date. This is the night before her follow-up c-section at full-term. Our skilled vet delivered four healthy puppies. Each member of our canine family lives in our home. We enjoy wrestling and cuddling with them. Our children love having one of these hypo-allergenic companions sleep in bed with them. Our puppies are coddled, hugged, and kissed. Being raised in the heart of our home, our puppies are accustomed to everyday noises and activities. They also love to play outside in their Puppy Pavillion. We want our puppies to be affectionate, playful, and confident. Growing up on a small farm, I am very familiar with caring for animals. We raised cows, goats, llamas, chickens, geese, and turkeys. We enjoyed our pet cats and a retired Shetland pony. We bred AKC Cocker Spaniels. As a young girl I raised Angora rabbits, hamsters, and parakeets. Between the various animals I witnessed countless births. I have fond memories of bottle feeding calves, (goat) kids, and puppies. Caring for animals has been an important part of my life. In college I studied nutrition, physiology, and business. I earned a Bachelor’s Degree in Health with an emphasis in Business Management. The principles of nutrition and hygiene I learned are useful in breeding healthy puppies and caring for a pregnant or lactating mother. The business training helps in running an organized business, including communication, receipts, contracts, records, and AKC registrations. This little California Bichon learned the command “sit” by her third day in her new home. Way to go, Shilo!